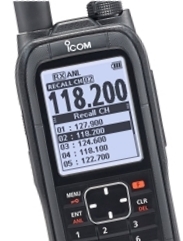 The IC-A25CE 8.33kHz/25kHz VHF Airband transceiver is the latest radio from iCOM replacing the discontinued IC-A6E line. It’s a cut-down version of its Big Brother, IC-A25NE, providing just COMMS and no NAV. It has 6 watts of output power, a stylish modern design, easy-to-use interface and large 2.3-inch LCD all combined to provide stress-free, simple in-flight operation. The 8.33kHz/25kHz handportable is ideal for customers who want a no-nonsense easy to use radio. A ‘Sport’ pack is available combining the IC-A25CE or IC-A25NE transceiver with the BP-289 AA Battery Case, CP-20 cigarette lighter cable with DC-DC converter, MB-133 belt clip, FA-B02AR antenna and hand strap. A ‘Pro’ pack is available combining the IC-A25CE or IC-A25NE transceiver with the BP-288 Li-Ion battery pack, OPC-2379 headset adapter cable, BC-224 rapid desktop charger, BC-06 AC adapter, CP-20 cigarette lighter cable with DC-DC converter, MB-133 belt clip, FA-B02AR antenna and hand strap.